Jerry Mthombothi, our Nelspruit Development Co-ordinator, recently visited June Shongwe on his farm in the Ehlanzeni district, in the Mpumalanga Province. 38 year old June wants to become a commercial farmer who wants to help other people by creating job opportunities. I farm on 15 ha arable land in the Ehlanzeni region, Barberton, in the Mpumalanga Province. Because of the drought we experienced this past planting season, I only managed to plant 4 ha of maize, 3 ha of beans and 2 ha of sweet potatoes. I usually plant more hectares than what I planted this season. This year I also managed to plant 5 hectares of Macadamia nut trees. My parents were farmers and I grew up on a farm. Any money my parents received from farming was spent on us children for food, paying school fees and other necessities needed to raise us. We never went hungry on the farm. Strengths: I own 22 pigs, 52 cattle, and 120 goats. I sell the pigs for between R1 200 and R1 500 each. I do not sell by female cows as I use them for breeding purposes, but sell the bulls for R6 000 or more. I sell the goats for R1 500 and the pregnant female Boere goats are sold for R2 000 each. I sell my cows and pigs at the Nelspruit and Barberton abattoirs but my goats are sold locally on my farm. I used to yield between 6 t/ha and 8 t/ha of maize which was sold at the Blank Water Mill in Nelspruit. I also keep some of the maize for making maize meal for consumption as well as for animal feed. When selling beans I would receive between R15 000 and R18 000 per ton. Weaknesses: Marketing our produce would sometimes be a problem but our biggest problem is the drought which has affected our produce this year. To make matters worse we do not have crop insurance when disasters like drought occur. When planting maize I used to yield between 2 t/ha and 3 t/ha but since I joined Grain SA I yield between 6 t/ha and 8 t/ha. When planting beans I used to yield ¼ t/h but now I yield more than 2 t/ha. I have gained a lot of knowledge on how to farm in a correct and productive way since I joined Grain SA in 2012. I was introduced to good quality seeds, shown how to take soil samples to determine the correct usage and application of fertiliser and shown how to check the pH of my soil. I was also shown which herbicides to use to control weeds. The Department of Agriculture in Mpumalanga also assisted me through the Asibuyele Esibayeni programme in 2013 from which I received 30 Nguni cows and one bull. 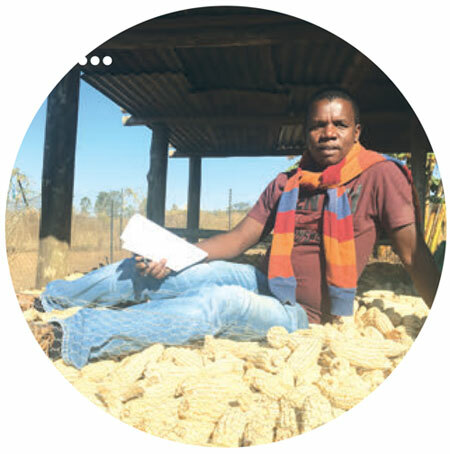 In 2014 I attended the Introduction to Maize Production course and I have also attended several study group meetings and farmers days where I was taught about various agricultural practices which I am currently using on my farm. Other courses that I attended and that were offered by the Department of Agriculture and other institutions include: Livestock Production, Poultry Production, Piggery and Vegetable Production. Currently I am attending a Business Management and Financial Management course every Tuesday, three times a month until the end of February 2017. This course was organised by Grain SA and sponsored by Syngenta. I would also still like to attend the Tractor and Farm Implements Maintenance course. In five years time I would like to see myself becoming a commercial farmer and having my own big farm. I want to help other people by creating job opportunities and fighting hunger and starvation. To young aspiring farmers I would say: "Agriculture is the backbone of all other professions – without farming there will be no food." Young people must not run away from agriculture, they must join the agricultural industry in order to create jobs for themselves, generate an income and create job opportunities for other people. Grain SA Farmer Development Programme, Mpumalanga. For more information, send an email to jerry@grainsa.co.za.